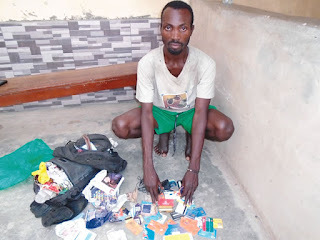 A ‘mad man’, Lanrewaju Jaiyeola, has been arrested with 22 Automated Teller Machine cards, two mobile phones and a power bank. He was nabbed by operatives of the Rapid Response Squad of the Lagos State Police Command on the Victoria Island area of Lagos State. The police said they were not convinced that Jaiyeola was actually mad, adding that initially, he was lucid before he started talking illogically. It was gathered that Jaiyeola, 39, was intercepted by the RRS operatives with a backpack on Ozumba Mbadiwe Road. One of the RRS men, who declined identification, said, “When we sighted him, he appeared like a mentally-ill man, but we invited him for interrogation. He responded normally to all our enquiries. “A few minutes into the interrogation, he started straying from the normal course of our enquiries and was not making sense at all. This raised further curiosity and we decided to search his backpack. It was learnt that eight of the credit cards were still valid, and they had different names and banks. The officers took him to their base in Alausa, Ikeja. A policeman at the base told our correspondent that the suspect made “statements suggestive of somebody disguising as a mad man to perpetrate crime”. He said, “Initially, we noticed that he was mentally balanced because he was answering the questions posed to him adequately. But all of a sudden, he started sounding incoherent and illogical again. “While interrogating him, he threatened the Investigating Police Officer, saying, ‘I will make life unbearable for you if you don’t let me go’. The police said the suspect was on their watch-list for about two weeks before he was arrested. The RRS Commander, Olatunji Disu, said Jaiyeola had been transferred to the Special Anti-Robbery Squad, Ikeja.